Tilt the banknote to see a rolling colour effect, which is visible on both sides of the banknote. Look for multiple security features in the clear top-to-bottom window. Tilt the banknote to see the Eastern Spinebill move its wings and change colour. The banknote designer's interpretation of the bird species Eastern Spinebill (Acanthorhynchus tenuirostris). Tilt the banknote to see the number ‘5’ change direction within the Federation Pavilion. The banknote designer's interpretation of the wattle species Prickly Moses (Acacia verticillata subsp. ovoidea). Feel for a raised bump on each of the long edges of the banknote. The Queen's portrait is based on photographs commissioned by the Reserve Bank in 1984. Look for a Federation Star in a small clear window. Look for an Eastern Spinebill that fluoresces under UV light. This depiction of the New Parliament House is the designer's interpretation of various photographs. The New Parliament House was opened in 1988 by Queen Elizabeth II. The artwork is the designer's interpretation of various architectural photographs of the Forecourt Mosaic. The Forecourt Mosaic is based on a Central Desert dot-style painting by Michael Nelson Jagamara titled ‘Possum and Wallaby Dreaming’. Clearly defined multi-coloured and multi-directional fine-line patterns appear on each side of the banknote. Tilt the banknote to see a three-dimensional Federation Star with a colourful border. Tilt the banknote to see colours change within the Eastern Spinebill. Federation Pavilion was the site of the official ceremony that marked the proclamation of the Commonwealth of Australia. The image is the designer's interpretation of various architectural photographs. This visual element is based on the aerial view of Parliament House building, including the House of Representatives, Senate and sporting facilities. Feel the distinctive texture of the raised, dark printing. Look for tiny, clearly defined text in multiple locations on the banknote. Look for a serial number and year of print that fluoresce under UV light. The image of the nib of a pen is representative of Gilmore and Paterson's works as writers. Tilt the banknote to see the Cockatoo move its wings and change colour. The banknote designer's interpretation of the bird species Sulphur-crested Cockatoo (Cacatua galerita). Tilt the banknote to see the number ‘10’ change direction within the homestead. The banknote designer's interpretation of the Bramble Wattle (Acacia victoriae). Feel for two raised bumps on each of the long edges of the banknote. This portrait of AB ‘Banjo’ Paterson is based on a photograph taken when he returned from the Boer War in 1900. Read AB ‘Banjo’ Paterson's biography. This image is the designer's interpretation of a horseman from the era of Paterson's writing. Look for tiny, clearly defined text in multiple locations on the banknote. This includes excerpts from The Man from Snowy River . ‘TEN DOLLARS’ is also microprinted in the coloured background. Look for a Cockatoo and wattle branch that fluoresce under UV light. Look for a pen nib in a small clear window. This image references life in the Australian bushland as described in Gilmore's poetry. The image is based on a photograph from the 1800s. Clearly defined multicoloured fine-line patterns appear on each side of the banknote. This portrait of Dame Mary Gilmore is based on a photograph of the poet taken when she was in her early twenties. National Library of Australia, Manuscripts Collection ‘MS 1662/5/5/71’. Tilt the banknote to see a three-dimensional pen nib with a colourful border. Tilt the banknote to see colours change within the Cockatoo's crest. This building is representative of the type of homestead referenced in Gilmore and Paterson's works. This image is based on a 1952 photograph sourced from the Herald and Weekly Times Limited portrait collection, Pictures Collection, State Library of Victoria. Look for tiny, clearly defined text in multiple locations on the banknote. This includes excerpts from the No Foe Shall Gather Our Harvest . ‘TEN DOLLARS’ is also microprinted in the coloured background. Tilt the banknote to see a three-dimensional compass with colourful lines. Tilt the banknote to see colours change within the Kookaburra's feathers and beak. This image depicts a building in Macquarie Place where Mary Reibey lived and conducted her business operations. The banknote designer's interpretation of the wattle species Acacia buxifolia. Feel for three raised bumps on each of the long edges of the banknote. This portrait of Mary Reibey, an astute and successful businesswoman in the 1800s, is based on a miniature watercolour on ivory, ca.1835. This image shows Sydney Cove in the 1800s. The Port Jackson schooner is indicative of the ships owned by Reibey and a traditional Eora nowie (canoe). The scene is based on an image by Jacob William Jones and a model of a schooner held by the Tweed Regional Museum. Look for tiny, clearly defined text in multiple locations on the banknote. The text includes the names of the ships owned by Mary Reiby: Edwin , Governor Macquarie , James , John Palmer , Mercury and Raven . ‘TWENTY DOLLARS’ is also microprinted in the coloured background print. Look for a Kookaburra and wattle branch that become visible under UV light. Look for a compass in a small clear window. This image depicts a De Havilland Dragon aircraft leaving a remote homestead in Broken Hill in 1948. This portrait of Reverend John Flynn, who is best remembered as the man who established the Royal Flying Doctor Service, is based on a 1930s photograph from the National Library of Australia. The compass represents navigation and links to Reibey and Flynn's work in shipping and air ambulance services. Tilt the banknote to see the Kookaburra move its wings and change colour. The banknote designer's interpretation of the bird species Laughing Kookaburra (Dacelo novaeguineae). Tilt the banknote to see the number ‘20’ change direction within the building. The pedal powered transceiver was developed by Alfred Traeger, and was used by the Australian Inland Mission (later the Royal Flying Doctor Service) to improve communication in remote areas. Look for tiny, clearly defined text in multiple locations on the banknote. The text includes passages from Reverend John Flynn's book The Bushman's Companion . ‘TWENTY DOLLARS’ is also microprinted in the coloured background print. Tilt the banknote to see a three-dimensional open book with colourful lines. Tilt the banknote to see colours change within the Black Swan's feathers and the ripples on the water. David Unaipon played a vital role with the Raukkan Church at Point McLeay. The banknote designer's interpretation of the wattle species Acacia humifusa. Feel for four raised bumps on each of the long edges of the banknote. This portrait of David Unaipon (Ngunaitponi), an inventor and Australia's first published Aboriginal author, is based on a photograph taken in 1938. Photo: State Library of South Australia – B 7326. These images are based on Ngarrindjeri shields from the 1850s and a Muriel Van Der Byl painting portraying the practices of miwi and navel cord exchange, known as nhung e umpie (ngia-ngiampe). Look for tiny, clearly defined text in multiple locations on the banknote. The text includes excerpts from David Unaipon's Legendary Tales of the Australian Aborigines . ‘FIFTY DOLLARS’ is also microprinted in the coloured background print. Look for a Black Swan and wattle branch that become visible under UV light. Look for an open book in a small clear window. Edith Cowan was instrumental in the establishment of King Edward Memorial Hospital, a much needed women's and maternity hospital. This original building is now known as Harvey House. This portrait of Edith Cowan, who is best remembered as the first female member of an Australian parliament, is based on a 1929 photograph from the biographical register of Western Australian Parliament. Tilt the banknote to see the Black Swan move its wings and change colour. The banknote designer's interpretation of the bird species Black Swan (Cygnus atratus). Tilt the banknote to see the number ‘50’ change direction within the church. The 1923 Women's Legal Status Act was one of Cowan's most important achievements during her term in parliament. Look for tiny, clearly defined text in multiple locations on the banknote. The text includes excerpts from Edith Cowan's maiden speech to Western Australian Parliament. ‘FIFTY DOLLARS’ is also microprinted in the coloured background print. The banknote designer's rendition of eucalyptus leaves was inspired by the species Scribbly Gum. The Queen's portrait is based on photographs commissioned by the Reserve Bank in 1984. The Queen gave her approval for use of this image on an Australian banknote in 1988. Microprint is very small but well-defined text that usually requires a magnifying glass to read. On the $5 banknote the microprint says ‘FIVE DOLLARS’ and is located on the upper left, above the image of gum leaves. When the banknote is held up to the light, a shadow image of the Australian Coat of Arms can be seen faintly, under other printing. On all genuine banknotes the window should be very clear and look like it's an integral part of the banknote, not an addition. 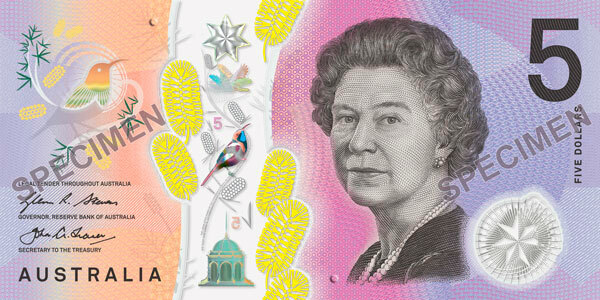 Inside the clear window on the $5 banknote there is a printed image of a stylised gum flower. When the banknote is held up to the light, a seven-pointed star within a circle is formed by four points on one side of the banknote combining perfectly with three points on the other side. Multi-coloured and multi-directional patterns of fine lines appear on each side of the banknote. This visual element is based on the Design Development Landscape Plan for the New Parliament House. These depictions of Australia's Old and New Parliament Houses are the designer's interpretation of architectural drawings and photographs. The Old Parliament House was opened in 1927 and the New Parliament House was opened in 1988. The patterns here reflect architectural items of the entrance to the ministerial wing of the New Parliament House and the skylights for the Members' Hall and the Main Committee Room. Under ultraviolet light, the serial number on the back of the $5 banknote glows and a square patch becomes visible. Intaglio is raised dark printing with a distinct feel. It's used for the portraits on banknotes and some other design elements. This image is the banknote designer's interpretation of an authentic horseman from the times of The Man From Snowy River . This portrait of AB ‘Banjo’ Paterson is based on a photograph taken at the time of his return from the Boer War in 1900. Inspired by the poem The Man From Snowy River , these images of horses are based on pictures that appeared in The Australian Newspaper in 1870 and The Illustrated Sydney News in 1875. This design element is taken from the 1903 publication of Marie Cowan's arrangement of Waltzing Matilda , which was used at the time to promote Billy Tea. On the $10 banknote, microprinted lines from AB ‘Banjo’ Paterson's poem The Man From Snowy River are located near his portrait. On the other side, excerpts from the poem No Foe Shall Gather Our Harvest are microprinted near the image of Dame Mary Gilmore. On all genuine banknotes the window should be very clear and look like it's an integral part of the banknote, not an addition. Inside the clear window on the $10 banknote there is a printed image of a stylised windmill and an embossed wave pattern. When the banknote is held up to the light, an image of the Australian Coat of Arms can be seen faintly, under other printing. This imagery of a country woman and the surrounding landscape was inspired by the themes of many of Mary Gilmore's writings. The image of a bullock team is based on an engraving entitled ‘The Wool Season’ that appeared in The Illustrated Australian News in 1881. The source for this design element is a portrait of Dame Mary Gilmore by the painter Sir William Dobell. It was painted in 1957 and hangs in the Art Gallery of NSW. This portrait of Dame Mary Gilmore is based on a photograph of the poet taken when she was in her early twenties. Read Dame Mary Gilmore's biography. Under ultraviolet light, the serial numbers on the back of the $10 banknote glow. The schooner Mercury was completed in Sydney in 1806. It was owned for a time by Mary Reibey. This image is based on an illustration commissioned by the Reserve Bank in 1993. This image is based on a miniature watercolour painted on ivory that is held at the State Library of New South Wales. It is the only known portrait of pioneer businesswoman Mary Reibey. This building in Sydney's George Street was once owned by Mary Reibey and comprised shops and dwellings. The image is based on an illustration in a book entitled Sydney in 1848 . Microprint is very small but well-defined text that usually requires a magnifying glass to read. The words ‘TWENTY DOLLARS’ are microprinted on the $20 banknote. On all genuine banknotes the window should be very clear and look like it's an integral part of the banknote, not an addition. Inside the clear window on the $20 banknote is an image of a compass, along with embossing of the number ‘20’. The air ambulance Victory flew the first Flying Doctor mission from Cloncurry, Queensland, on 17 May 1928 after Qantas entered into a unique venture with Reverend John Flynn of the Australian Inland Mission Service. This is an interpretation of one of the first pedal-powered generators to operate the transceiver wireless sets, the sole method of communication on outback stations. This portrait of Reverend John Flynn, founder of the Royal Flying Doctor Service, is based on an original photograph held by the National Library of Australia. Read Reverend John Flynn's biography. This image is based on a photograph taken of Reverend Col Harland in 1919 and provided by the National Library of Australia. Reverend John Flynn purchased five camels in 1913 for his ‘Patrol Padres’, who undertook mission work throughout central Australia. Under ultraviolet light, the serial numbers on the back of the $20 banknote glow and a patch showing the value of the banknote becomes visible. This image depicts the mission church at Point McLeay as it was in the late 19th century. Point McLeay (the Aboriginal name is Raukkan) is the community where David Unaipon's people live. This portrait of David Unaipon, an inventor and Australia's first published Aboriginal author, is based on an original photograph taken in 1938. This element is based on drawings from David Unaipon's 1909 patent application for an improved mechanical handpiece for sheep shearing. This is an extract from David Unaipon's handwritten preface to his story Legendary Tales of the Australian Aborigines . It's based on copies of the original manuscript provided by the State Library of New South Wales. Microprint is very small but well-defined text that usually requires a magnifying glass to read. On the $50 banknote, the words ‘FIFTY DOLLARS’ are microprinted. On all genuine banknotes the window should be very clear and look like it's an integral part of the banknote, not an addition. Inside the clear window on the $50 banknote is a printed image of the Southern Cross, along with embossing of the number ‘50’. This drawing shows the original front of the West Australian Parliament House, as it was in the 1920s when Edith Cowan was an MP. This portrait of Edith Cowan, who is best remembered as the first female member of an Australian parliament, was based on a 1929 photograph from the biographical register of West Australian Parliament. This composite illustration represents a foster mother and children who were wards of the state circa 1920. This image of Edith Cowan at a lectern represents her frequent public speaking on matters such as women's rights and children's welfare issues. Under ultraviolet light, the serial numbers on the back of the $50 banknote glow and a patch showing the value of the banknote becomes visible. This image is based on a 1903 photograph of the interior of Her Majesty's Theatre in Sydney. A performance at this theatre in September 1911 was a highlight of Dame Nellie Melba's career. This design element is based on Dame Nellie Melba's signature, which appeared on the program used for her farewell performance at the Royal Albert Hall, London in June 1926. The 1902 Australian Concert Tour is of special significance as it was Dame Nellie Melba's first return to Australia from her successful overseas performances. The monogram on the program was designed by Dame Nellie Melba. Dame Nellie Melba achieved international recognition as a soprano and enjoyed star status within Australia. This portrait is based on a photograph that appeared in a 1909 biography by Agnes G. Murphy. Read Dame Nellie Melba's biography. Microprint is very small but well-defined text that usually requires a magnifying glass to read. On the $100 banknote the words ‘ONE HUNDRED DOLLARS’ and the number ‘100’ are microprinted. On all genuine banknotes the window should be very clear and look like it's an integral part of the banknote, not an addition. Inside the clear window on the $100 banknote is an image of a lyrebird, along with embossing of the number ‘100’. This Rising Sun badge was adopted as the Australian Imperial Force badge and worn in World War I. Permission to use the badge on the $100 banknote was provided by the Australian Army. This is the designer's interpretation of mounted soldiers in World War I. This portrait is based on a photograph of Sir John Monash taken in 1912. Monash was one of Australia's greatest military commanders. Read Sir John Monash's biography. Based primarily on a photograph taken in 1917 entitled Artillery in Noreuil Valley , this image shows batteries of the 2nd Australian Division attacking the Hindenburg Line. Under ultraviolet light, the serial numbers on the back of the $100 banknote glow and a patch showing the value of the banknote becomes visible.